For other uses, see Kaymaklı (disambiguation). A large room several floors down into the city. when the news came of the recent massacres at Adana, a great part of the population at Axo took refuge in these underground chambers, and for some nights did not venture to sleep above ground. A view showing several floors at once. A remarkable block formation of andesite (a volcanic rock) with several holes, used in Kaymakli for cold copper processing. ^ Peter Mackridge,"Some Pamphlets on Dead Greek Dialects': R.M. Dawkins and Modern Greek Dialectology", 1990. p. 205. "Anyone who attempts to find the Greek villages of Cappadocia today, either on the map or on the ground, is first faced by the problem that their names have been obliterated, a chauvinistic practice not only prevalent in modern Turkey, but practiced in Greece as well. Visitors to the so-called 'underground cities' at Kaymakli and Derinkuyu have difficulty in ascertaining that until 1923 they were called Anaku and Malakopi respectively (the latter being the Μαλακοπαία of Theophanes. Once located, however, these villages bear obvious traces of their Greek Christian past in the shape of sizable churches (some of which have been converted into mosques and are therefore well preserved, but with their frescoes covered with whitewash), and a number of rather elegant houses, whose Greekness is betrayed only by the initials and dates (usually about ten years before the 1923 exchange of populations." ^ Horrocks, Geoffrey C. (2010). Greek: A History of the Language and Its Speakers. John Wiley & Sons. p. 403. ISBN 978-1-4051-3415-6. None the less, at the beginning of the 20th century, Greek still had a strong presence in Silli north-west of Konya (ancient Ikonion), in Pharasa and other villages in the region drained by the Yenice river (some 100km south of Kayeri, ancient Caesarea), and in Cappadocia proper, at Arabison (Arapsu/Gulsehir) north-west of Nevsehir (ancient Nyssa), and in the large region south of Nevsehir as far down as Nigde and Bor (close to ancient Tyana). This whole area, as the home of St Basil the Great (329-79), his brother St Gregory of Nyssa (335-94) and his friend St Gregory of Nazianzos (330-89), was of great importance in the early history of Christianity, but is perhaps most famous today for the extraordinary landscape of eroded volcanic tufa in the valleys of Goreme, Ihlara and Soganh, and for the churches and houses carved into the ‘fairy chimneys’ to serve the Christian population in the middle ages. Many of the rock-cut churches, which range in date from the 6th to the 13th centuries, contain magnificent frescos. Away from the valleys, some of the villages have vast underground complexes containing houses, cellars, stables, refectories, cemeteries and churches, affording protection from marauding Arabs in the days when the Byzantine empire extended to the Euphrates, and serving later as places of refuge from hostile Turkish raiders. The most famous of these are at Kaymakli and Derinkuyu, formerly the Greek villages of Anaku (Inegi) and Malakopi (Melagob), where the chambers extended down over several levels of depths of up to 85 metres. ^ a b Darke, Diana (2011). Eastern Turkey. Bradt Travel Guides. pp. 139–140. ISBN 978-1-84162-339-9. The area became an important frontier province during the 7th century when Arab raids on the Byzantine Empire began. 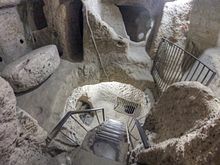 By now the soft tufa had been tunneled and chambered to provide underground cities where a settled if cautious life could continue during difficult times. When the Byzantines re-established secure control between the 7th and 11th centuries, the troglodyte population surfaced, now carving their churches into rock faces and cliffs in the Goreme and Sogamli areas, giving Cappadocia its fame today. […] At any rate here they flourished, their churches remarkable for being cut into the rock, but interesting especially for their paintings, relatively well preserved, rich in coloring, and with an emotional intensity lacking in the formalism of Constantinople; this is one of the few places where paintings from the pre-iconoclastic period have survived. Icons continued to be painted after the Seljuk conquest of the area in the 11th century, and the Ottoman conquest did not interfere with the Christian practices in Cappadocia, where the countryside remained largely Greek, with some Armenians. But decline set in and Goreme, Ihlara and Soganli lost their early importance. The Greeks finally ending their long history here with the mass exchange of populations between Turkey and Greece in 1923. ^ Kinross, Baron Patrick Balfour (1970). Within the Taurus: a journey in Asiatic Turkey. J. Murray. p. 168. ISBN 978-0-7195-2038-9. Its inhabitants were Cappadocian Greeks, who may have found a refuge here, perhaps from Roman, from Iconoclast, or later from Turkish and Mongol threats. Urgup itself was the Byzantine Prokopion; the Emperor Nicephoros Phocas is said to have passed this way, after his Cilician campaign; and the neighborhood was populous enough to support, at different times, a number of bishoprics. ^ Dawkins, R.M. (1916). Modern Greek in Asia Minor. A study of dialect of Silly, Cappadocia and Pharasa. Cambridge University Press. p. 17. Retrieved 25 October 2014. these excavations are referred to as long ago as the campaigns of Timour Beg, one of whose captains was sent to hunt out the inhabitants of Kaisariyeh, who had taken refuge in their underground dwellings, and was killed by an arrow shot through the hole in one of the doors. ^ Dawkins, R.M. (1916). Modern Greek in Asia Minor. A study of dialect of Silly, Cappadocia and Pharasa. Cambridge University Press. p. 16. Retrieved 25 October 2014. their use as places of refuge in time of danger is indicated by their name καταφύγια, and when the news came of the recent massacres at Adana [in 1909], a great part of the population at Axo took refuge in these underground chambers, and for some nights did not venture to sleep above ground. ^ Dawkins, R.M. (1916). Modern Greek in Asia Minor. A study of dialect of Silly, Cappadocia and Pharasa. Cambridge University Press. p. 16. Retrieved 25 October 2014. ^ Rodley, Lyn (2010). Cave Monasteries of Byzantine Cappadocia. Cambridge University Press. p. 1. ISBN 978-0-521-15477-2. The tenth-century historian Leo the Deacon records a journey to Cappadocia made by Nikephoros Phokas shortly before he became emperor. Perhaps to recapture the attention of readers beginning to tire of troop movements, he also offers a scrap of information about a curiosity of the region to which the emperor was heading: its inhabitants were once called troglodytes, because ‘they went underground in holes, clefts and labyrinths, as it were in dens and burrows’. This brief note was probably not based on first-hand knowledge but it might have been prompted by an awareness of the vast number of rock-cut cavities in an area to the west and southwest of Kaisareia (Kayseri of modern Turkey). Had Leo been more inclined to garrulous digression (or perhaps just better informed), he might have supplied more details of the troglodyte region and the task of bringing scholarly order to the hundreds of rock-cut monuments and other cavities in the area might have been much similar. ... At this time the region was still inhabited by a mixed population of Turkish-speaking Moslems and Greek-speaking Christians. The latter group left for Greece in the early 1920s, during an exchange of population of minorities that was part of the radical social re-ordering initiated by Kemal Ataturk; they were replaced by Turks from Greece, mostly from Thrace. In the two decades before this upheaval, however, members of the local Greek population acted as guides to Guillaume de Jerphanion, who made several visits to the volcanic valleys and wrote his meticulous descriptions of many painted Byzantine rock-cut churches. Wikimedia Commons has media related to Kaymaklı underground city.